If you’ve paid any attention to the craft beer market during the last decade or so, you’ll be familiar with seasonal releases. These are special beers that brewers are releasing to the market during different times of the year. They can go from lighter bodied lagers and weissbiers in the summer, to fall pumpkin ales or fresh hop ales, to the now seemingly ubiquitous winter seasonals. The basic idea is that certain beers are more appropriate for certain seasons. It’s a trend that is also embraced by local Southern Oregon breweries, but has its roots in beer history. Most likely, the first truly seasonal beers were produced in Bavaria. In the days before refrigeration, the lagering process that has become such an integral part of the German beer tradition became more difficult to accomplish during the warmer months. Typically the last brewing was done in March, and they would then take the barrels and store them in alpine caves packed with ice over the summer. When the weather began again to cool down and the harvest arrived, they would break out these Märzens, which in turn became the official beers of the Bavarian Oktoberfest. It’s difficult to find out exactly who started marketing seasonal beers in the United States, but my money’s on Anchor Brewing from San Francisco—you may be familiar with their blue-capped bottles of Anchor Steam. In 1975 they produced their first Anchor Christmas Ale, and have been making this seasonal continuously for 40 years. If we further focus our lens on Oregon, we can see a small brewery in Bend making the first generation of Jubelale in 1987. Over the past 28 years, this beer has become synonymous with winter, and its release is widely anticipated each year. The next year, in 1988, a one year old brewery out of Hood River called Full Sail produced the winter seasonal Wassail. And after that, the winter seasonals began popping up with increasing regularity. Fast forward about a decade and we have Jim Mills, a former employee at Rogue Brewery, who opened Caldera Brewing in 1997. Caldera has been part of the seasonal beer renaissance since its inception. Ray Cato, part of the inner circle since the beginning and brand manager since 2005, says that they are and always have been “committed to quality over quantity.” And while it might be possible to take issue with quantity (they brew 45 different beers) you certainly can’t take issue with the quality. It should be noted that while Caldera produces a handful of year-round beers, it’s the seasonals—and as Cato likes to refer to them, the “occasionals”—that really fill out the Caldera offerings. “During the winter months you can expect to see darker, more robust beers,” says Cato, “because that’s what people are more interested in drinking.” The Old Growth Imperial Stout and South Side Strong are just two that fit this bill. But Caldera is constantly trying new things, and brewing special eight to ten barrel batches of unique beers. Among their occasionals are their collaboration with Hawaii’s Big Island Brew House—Big Island Red Sea and the Roasted Hatch Chili Ale. They have also been experimenting with bourbon barrel aged ales that they age three to six months in Makers Mark oak barrels. They’ve barrel aged the Toasted Coconut Chocolate Porter and the Mogli Imperial Porter, but plan on doing more. Caldera is not the only local brewery embracing the seasonal offerings. Medford’s Opposition Brewing, founded in 2012, is also on board. They’re making a surprisingly diverse number of seasonal releases out of their humble tap house located inside the brewing room, and affectionately referred to as “The Bunker” by their faithful. Co-owner and founder, Nick Ellis, believes the winter seasonals have more traction. “People seem to expect special beers during the winter months.” And opposition doesn’t disappoint. During the colder months you can expect to see Long Black Train Imperial Oatmeal Milk Stout, Mayan Meltdown Brown, Krampus Peppermint Mocha Stout, and Nickabod Cranium Pumpkin Ale. For Ellis, the seasonals build excitement and loyalty, and allow a brewer to match beer to the climate. Like Caldera, Opposition also has a grouping of lighter seasonals they release during the summer months. It’s not difficult to imagine a future in which most craft breweries have a handful of staple beers that are then augmented by the seasonal and occasional creations of their brewers. For instance, every October Caldera comes out with their “Cauldron Series,” and other breweries regionally are doing specially timed series as well. In the same way that we eat seasonally, we are beginning to drink our beer seasonally. This is something that both Ellis and Cato are aware of, and something that their brands embrace. Space does not allow me to mention all of the amazing craft breweries in Southern Oregon that have joined the seasonal and occasional renaissance. I leave the adventure of finding them up to you. 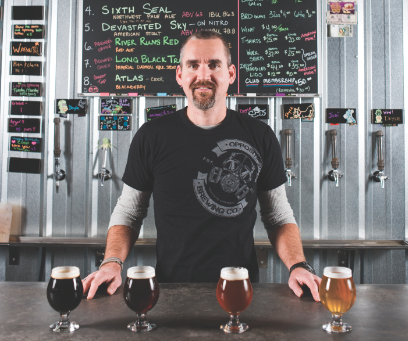 Oregon is in the vanguard of the global beer industry, and Southern Oregon is no exception. 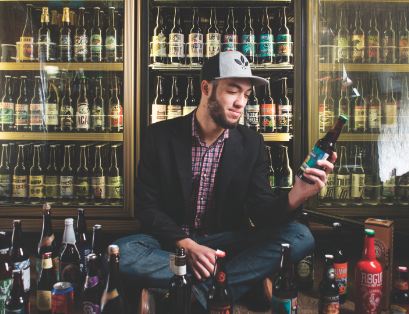 Visit your local beer store or tap room, and ask them what they have for seasonal releases. You’ll likely be surprised at how many options you’ll find.